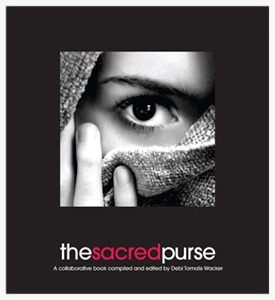 The Sacred Purse is a literary celebration about the perfection of women – and the perfection of each woman. Written by, for and about women, this book is a collaborative literary fusion of short stories, poetry, streams of consciousness, and prose. A look inward, the literary pieces focus on the many “faces” of a woman: daughter, mother, partner, artist, survivor, provider and friend. What began as an outlet for our creative expression has been transformed into an inspirational collection that covers the emotional gamut: humorous, deeply moving, tearful, meditative and a strong, casual connectedness to female readers seeking inspiration. We are teachers, mothers, journalists, managers, librarians, bankers and friends. As alike and different as we are, we came together over the course of a year to share and write The Sacred Purse. Editor/Chief Author Debi Tomalis Wacker organized, wrote stories for, and coordinated the project along with a great group of women! For the creative process, each meeting, a new topic was picked relating to women's issues and the role of women, and each of the members wrote stories, poems, and other art. The book is currently available on Amazon and other online retailers.